At J&J Material Handling Systems, we design and install optimal material handling solutions. Then we provide training and follow-up support so you can run your system at peak efficiency. We invite you to call us at 1-800-821-1054 to discuss your material handling project and request a quote. We analyze your material handling problems and automation requirements. Then we design a solution that fits your needs and your budget. Finally, we deliver and configure the entire system. When you need to increase storage and work space within the footprint of your warehouse or industrial building, there’s no better way than with a safe, efficient mezzanine. We handle everything, from start to finish. 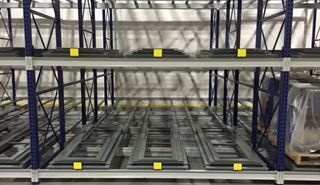 Push back racks are safer, allow for faster picking, and can increase efficiency by up to 60% compared to selective racking. Our team can help you design and plan a push back racking system tailored to your needs. Our team will analyze the existing problems at your docks and design a system that will solve those problems and go beyond to offer increased safety and efficiency. We will engineer and install a solution that fits your needs and your budget. Our service starts with engineering and carries all the way through installation. We’ll get you up and running quickly and keep things operating smoothly. We stock spare parts to help minimize downtime. Call J&J Material Handling Systems at 1-800-821-1054 to talk to us about your custom material handling project. We also welcome you to use the form on this page to request a quote. We are typically able to provide you with a quote in one business day.